Gibbons distinguishes between shades in the Coat of Arms issues and defines the ½ peso issues incompatibly with Scott. Peru had a compex beginning. The Postmaster General, M.A. Davila, proposed the use of adhesive stamps in March 1851 and received preliminary approval in May of that year but six years passed before a service was implemented. 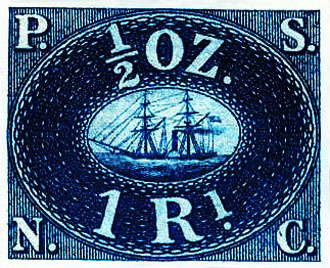 Final authority was granted in October 1857 but, while waiting for its own stamps, Peru experimented with a service between Lima and Chorillos using stamps obtained from the Pacific Steam Navigation Company. The PSNC had ordered the stamps from Perkins Bacon in London, but not used them. 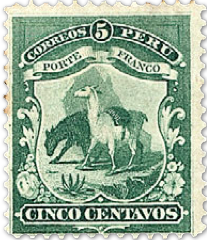 The first real Peruvian stamps, displaying the country's arms. were lithographed by Emilio Prugue of Lima and first used on 1st March 1858. The first stamps to use the name Peru were issued in 1866 and printed by the American Banknote Company (1866, Sc16 SG17 shown). There were numerous local Peruvian issues during times of unrest that will be dealt with separately and also an occupation issue from the War of the Pacific, 1879-83. Deriving from a quarrel between Chile and Bolivia over the taxation of Chilean nitrates, Peru became involved because of a treaty with Bolivia and was occupied by Chile in 1881. 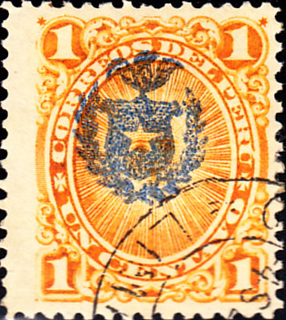 Overprinted Chilean stamps were used until 1883. Gibbons lists a number of occupation issues which Scott had previously catalogued but now regards as normal Chilean stamps merely cancelled in Peru (1881 Sc-N11 SG57 shown) . Images from David Olson, Wikipedia, The Philatelic Database.